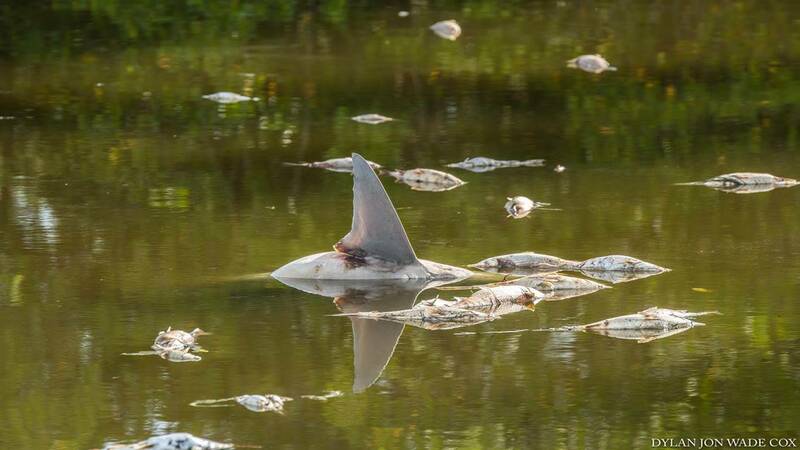 A decaying bull shark is seen among dead fish at Sara Bay Marina in Sarasota. Photo taken Aug. 16, 2018 by Dylan Jon Wade Cox. Many Floridians don't realize exactly how widespread the problems with blue-green algae and red tide are. More than 100 miles of beaches along the Gulf Coast are experiencing fish kills and putrid smells from red tide toxins, while dozens of freshwater bodies in South Florida are slick with slime from blue-green algae. Neither issue is contained to a single waterway, and experts say it's unclear when these harmful algal blooms will end. While leaders in environmental science are fighting these dilemmas head-on, Floridians are encouraged to stay abreast of where the problems are the worst so they can avoid the potential negative health effects. Below you'll find resources from state agencies that can help you track these issues and plan your aquatic outings accordingly. 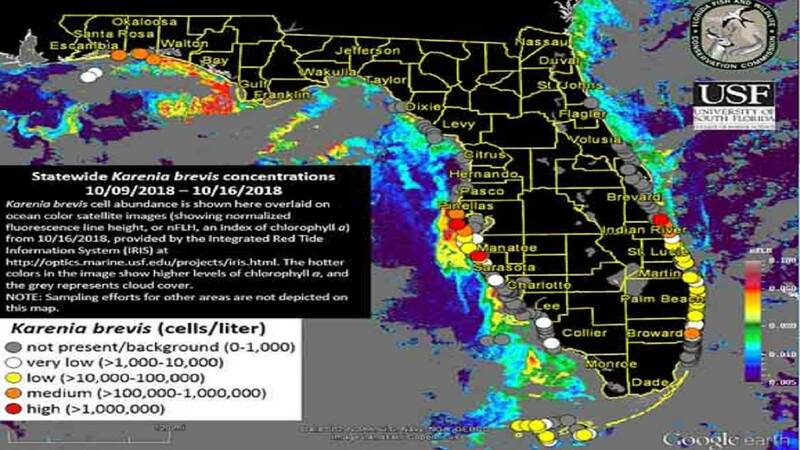 The Florida Fish and Wildlife Conservation Commission has been monitoring the Karenia brevis bloom, also known as red tide, on the Gulf Coast for months. Each week, FWC posts the latest counts and conditions on a special section of its website dedicated to red tide monitoring. Contained among the information on myfwc.com/redtidestatus is a color-coded status map that's updated every Friday. Bright red dots indicate where the bloom is the worst, while orange dots show where levels are in the medium range and yellow dots illustrate areas where red tide is present but in low levels. Weekly change is also noted on the page, meaning Floridians can see where red tide conditions are improving and where they're getting worse. Although that web page is usually only updated once a week, anyone interested in the current red tide status can call FWC's hotline at 866-300-9399 if you're calling from within Florida or 727-552-2448 if you're calling from out of state. You can see an interactive version of the same map embedded above by going to the National Oceanic and Atmospheric Administration's harmful algal blooms observing website here, and you can also find information on red tide forecast predictions from the Ocean Circulation Group here. There's a technical term for the layer of toxic sludge blanketing Lake Okeechobee: blue-green algae. Unfortunately, this unsightly mess isn't just contained to Lake Okeechobee, which just so happens to be the largest freshwater lake in the state. As discharges from the swollen lake have been released through canals to the east and west, the bloom has spread. Data from the Florida Department of Environmental Protection shows that dozens of rivers and lakes on either coast radiate from the massive lake. The map, embedded above, shows where algae samples have been taken within the past three months. Blue dots show where samples were taken in the past 30 days, green dots show reports within 31 to 60 days and yellow dots indicate reports within 61 to 90 days. Looking at the map, you'll see a lot of dots, but in a few instances, tests turned up negative or the DEP employee determined that water conditions were normal. Clicking any dot on the map will provide information about where the sample was taken, when it was taken, what type of sample it was and if any toxins were present. Pictures of the blooms are also available for some samplings. The DEP is made aware of these blooms thanks, in part, to public reporting. Potential algae blooms can be reported by calling 855-305-3903 or by clicking here. For more information on what you can do to help improve the condition of Florida's waterways, click here. You can also go to ClickOrlando.com/water for full News 6 coverage on Florida's dirty water situation.